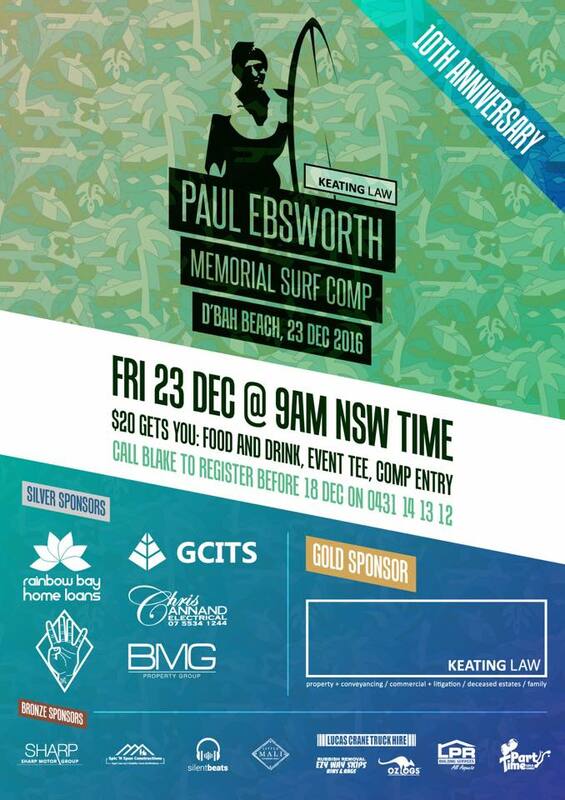 The Sharp Motor Group team are proud to be sponsoring the Paul Ebsworth Memorial Surf Comp at D’Bah on December 23rd 2016. The event is now in it’s 10th year and raises funds for the Australian Lung Foundation. Organised by local Blake Ebsworth, the event was inspired by his father Paul Ebsworth who tragically passed away from lung cancer in 2006. Paul was just 52 years old, and had never smoked a day in his life, yet was diagnosed with lung cancer from passive smoke and lost his battle a mere four months later. There’s still time to register for the male or female open comp. Registration is just $20 and includes food & drink and an event t shirt. Whether you’re a shredder or a spectator, it’ll be a fantastic day out, plus you’ll give yourself the chance to win some fantastic prizes. Sharp Motor Group are sponsoring a prize of a new Holden Colorado for a weekend + $100 voucher for Cafe DBah! Details on how to register are below, don’t miss the chance to support this great local surf comp and help the Australian Lung Foundation continue their work!